Dinosaur Comics - March 11th, 2010 - awesome fun times! –They're in museums for you to look at when you're bored!! 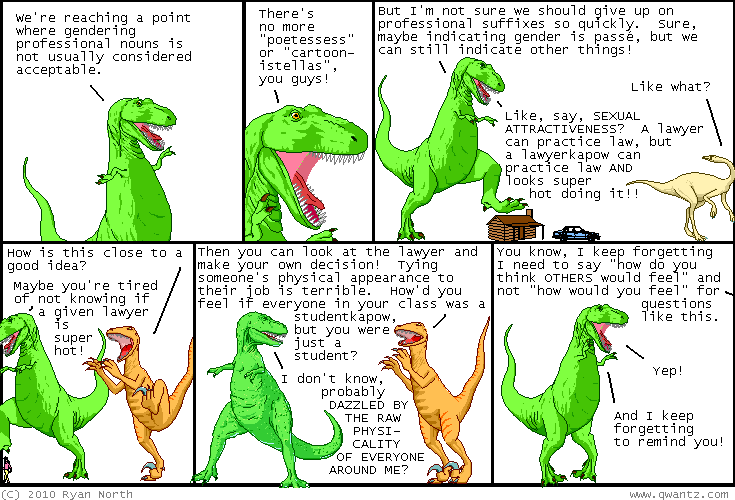 March 11th, 2010: Brad took the Qwantz Corpus I linked to the other day to help the efforts to solve my yet-unsolved anagram, threw in some Markov chains, and used it to write a program that generates new Dinosaur Comics automatically! He's posted some results and they're pretty awesome. And there's more of them today! One year ago today: my father wanted a comic about this for his birthday. HAPPY BIRTHDAY DAD.